The women of Whitechapel are at the forefront of this episode, as an abortionist is found murdered with money stuffed inside his throat, and Frayn resolves to provide illegal contraception and safe terminations in the Obsidian clinic against Susan’s wishes. While Reid is still struggling with flashbacks and disorientation following his shooting, Drake is having problems plucking up the courage to ask for Rose’s hand in marriage. The investigation into Currie’s death takes Reid to Dr. Frayn, who has treated some of the girls poisoned by the murdered chemist. Frayn tells Reid of the soul-destroying nature of her work, not being able to educate women in preventative measures and knowing they are destined to be maimed or killed by back-alley butchers. Frayn later approaches Susan, and suggests that they perform abortions at the clinic, as practised by her former tutor, Dr. Rolle, but Susan refuses, and Frayn decides to go ahead with her plans anyway, encouraged by her seemingly progressive mentor. One of Currie’s victims, a young woman called Mary Tait, is rushed to the clinic with lead poisoning. It transpires that she is the key to the mystery with both her lover, Edwin, and her father, George, suspected of offing Currie. It’s young Mathilda Reid who helps Drake solve the riddle of George Tait – fittingly over some strawberry ices – when she likens George’s status as a ‘prisoner but not a convict’ to being a little girl. Tait (a brilliant performance from Haydn Gwynne) is revealed as a woman passing as a man to avoid the oppression she would otherwise have encountered, and seeks to protect her ward, Mary, from the same. George is discovered to have killed Currie, having witnessed her own mother slowly ruined by birthing twelve children. It’s not clear whether there is more to George’s desire to be thought of as male, but Mary refers to her being made to wear a gown on her way to the gallows as a final indignity. Once again, it’s testament to the incredible writing and performances in this show, that the final scene between Mary and George – two supporting characters who are introduced for the first time in this episode – moved me to floods of tears. While George must pass as male to get by, and ultimately ends up paying a terrible price for her transgression, Susan also attempts to square up to the men who would best her in business following Capshaw’s death. While she manages to retain her power by playing dirty, her desire to maintain a veneer of respectability becomes her cage when she discovers she is pregnant after her tryst with Jackson. Confiding in Frayn, Susan gives her blessing for the doctor to proceed with her plans for the clinic, but Frayn is appalled to learn that Rolle has actually been carrying out sterilisation procedures on unwitting patients, advocating the use of eugenics to control the population. While Mary and Susan have their agency compromised by pregnancy outside the socially accepted institution of wedlock, Rose fears having her autonomy taken from her by the very act of marriage itself, when Drake forbids her from staying with Susan, whom he suspects had a hand in the train robbery. It takes his experience with George and his conversation with Mathilda – herself constrained by the very fact of her being a ‘little girl’ – for Drake to realise he is complicit in the repression of women. Reid too, receives a dressing down from Jane Cobden when he assumes she will take responsibility for his daughter while he works the case. Which leads us to the set up for the finale – the return of Theodore Swift, Susan’s estranged and dastardly father, and owner of the stolen bearer bonds. With Fred Best on the case, and Jackson in possession of the truth about who shot Reid, the last episode of this blinding series is set to be an explosive one. 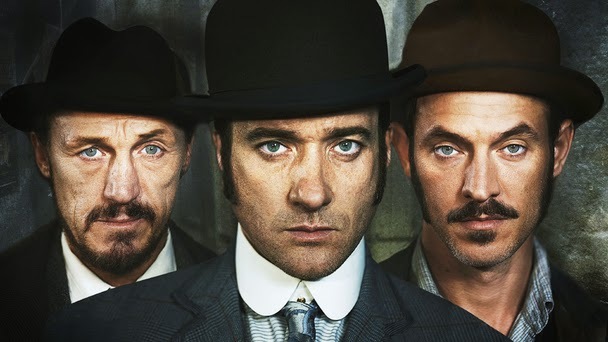 This entry was posted in Uncategorized and tagged drama, review, ripper street, TV, victorian. Bookmark the permalink.